Everton were at their brilliant best as they beat Arsenal 3-0 to record a sixth successive league win and in the process move one point behind the Gunners in the race for the final Champions League place. This resilient and at times brilliant performance will have made Arsene Wenger and the rest of the Premier League pay serious consideration to Roberto Martinez’ Everton as the Blues demolished Arsenal over 90 minutes and left the foundations of Goodison Park rocking to the sound of 37,000 Evertonian voices. The match started at a ferocious pace with Leon Osman at the centre of everything that happened in the opening 10 minutes. He first flashed a volley inches wide of the Arsenal goal before he received a horrific eye injury, which forced him from the pitch in a tackle with Sagna that rightly resulted in a yellow card. Everton could have been destabilised by the loss of Osman, but instead they pushed on undeterred and took the lead just a couple of minutes later. A cleaver ball from the left played in Romelu Lukaku who fired a powerful shot towards goal which Szczesny did well to save only for Steven Naismith to follow up and pass the ball into the corner of the empty net. 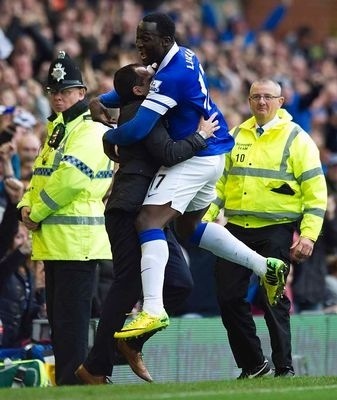 The second goal was the result of Martinez’ astute tactics. Sensing a weakness on the Arsenal left, the Everton manager deployed Lukaku in a right sided attacking role and when the ball was played out to the big Belgium he powered towards the Arsenal penalty area before drifting inside, beating two men and powerfully drilling a shot past the helpless Arsenal keeper to cap off a perfect opening half. Arsenal briefly threatened a revival after the interval but in truth they were always second best to Everton. The third and final goal arrived on the hour mark. Kevin Mirallas did brilliantly to disposes Sagna and drove forward towards the Arsenal goal. He played in Naismith only for the Scot to be denied by Szczesny, however the ball bobbled lose into the middle of the penalty area and a combination of Mirallas and ex Everton midfielder Arteta bundled the ball into the unguarded net.